When people think of you, are their hearts filled with gratitude? If they are, it’s because you poured value into their lives. The opportunity to give indicates you have already received. Open your heart before you have everything you want. Generosity is privilege, not obligation. Pour into those who pour out for others. Don’t pour into black holes. You end up empty if all you do is give. Being respected amplifies gratitude. The more authority you have, the more powerful your expressions of gratitude. 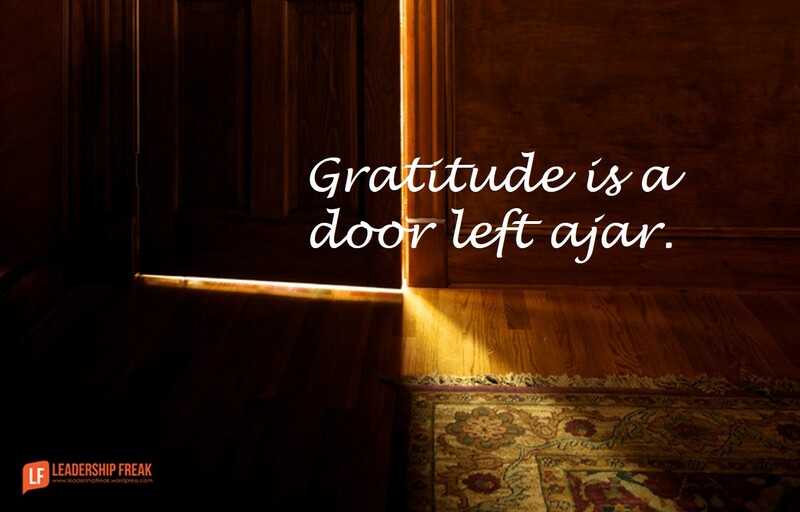 Gratitude is a door left ajar that opens hearts and expands influence. Notice things. Rise above tendencies to walk down the hall lost in thought. Take another’s perspective. What’s it like to be in their shoes? Say what you feel. Remember why you hired them in the first place? Allow gratitude to stand on its own. Don’t use it as a lever. Wonderful. And we ALL have many things to be thankful for. So, that workplace recognition is important, since the workplace supports so much of the heart of so many. I LOVE and hopefully LIVE in GRATITUDE! Walk with it daily and you will be surprised how your outlook changes.